In the first installment of this series, we'll learn about the concept of microservices and look at how to create a microservice with Spring Boot and Spring Cloud. This guide will help you learn the basics of microservices and microservices architectures. We will also start looking at a basic implementation of a microservice with Spring Boot. We will create a couple of microservices and get them to talk to each other using Eureka Naming Server and Ribbon for client-side load balancing. This is a 5-part article series. In part 1 of this series, let's introduce the concept of microservices and understand how to create great microservices with Spring Boot and Spring Cloud. What are the challenges with microservices? How do Spring Boot and Spring Cloud make developing microservices easy? How to implement client-side load balancing with Ribbon. How to implement a Naming Server (Eureka Naming Server). How to connect the microservices with the Naming Server and Ribbon. Do not worry if you are not clear about a few things. The idea is to give a big picture before we get our hands dirty and create the microservices step by step. Forex Service (FS) is the Service Provider. It provides currency exchange values for various currency. Let's assume that it talks to a Forex Exchange and provides the current conversion value between currencies. The request above is the currency exchange value for EUR to INR. In the response, conversionMultiple is 75. We will talk about port in the response a little later. Based on the load, we can have multiple instances of the Currency Conversion Service and the Forex Service running. The number of instances for each service might vary with time. Below picture shows a specific instance where there are five instances of the Forex Service. What needs to happen in the above situation is load should be uniformly distributed among these five instances. In this series of articles, we will use Ribbon for Load Balancing and Eureka Naming server for registering all microservices. Do not worry if you are not clear about a few things. The idea is to give a big picture before we get our hands dirty and create the microservices step by step. 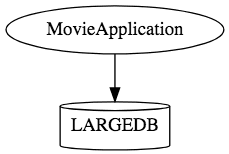 What Is a Monolith Application? Which is released (taken to production) once every few months? Which has a wide range of features and functionality? Which has a team of more than 50 working on it? Where debugging problems is a big challenge? Where bringing in new technology and processes is almost impossible? Microservice architectures evolved as a solution to the scalability and innovation challenges with monolithic architectures. REST - Built around RESTful Resources. Communication can be HTTP or event based. What Does Microservice Architecture Look Like? This is how the same application would look like when developed using microservices architecture. Microservice architectures involve a number of small, well-designed components interacting with messages. New technology and process adaption becomes easier. You can try new technologies with the newer microservices that we create. Quick setup needed: You cannot spend a month setting up each microservice. You should be able to create microservices quickly. Automation: Because there are a number of smaller components instead of a monolith, you need to automate everything - Builds, Deployment, Monitoring, etc. Visibility: You now have a number of smaller components to deploy and maintain, maybe 100 or maybe 1000 components. You should be able to monitor and identify problems automatically. You need great visibility around all the components. Bounded Context: Deciding the boundaries of a microservice is not an easy task. Bounded contexts from Domain Driven Design are a good starting point. Your understanding of the domain evolves over a period of time. You need to ensure that the microservice boundaries evolve. Dynamic scale-up and scale-down: The advantages of microservices will only be realized if your applications can be scaled up and down easily in the cloud. Pack of Cards: If a microservice at the bottom of the call chain fails, it can have knock-on effects on all other microservices. Microservices should be fault tolerant by Design. Debugging: When there is a problem that needs investigation, you might need to look into multiple services across different components. Centralized Logging and Dashboards are essential to make it easy to debug problems. Consistency: You cannot have a wide range of tools solving the same problem. While it is important to foster innovation, it is also important to have some decentralized governance around the languages, platforms, technology and tools used for implementing/deploying/monitoring microservices. Spring Cloud provides solutions to cloud-enable your microservices. It leverages and builds on top of some of the Cloud solutions opensourced by Netflix (Netflix OSS). Configuration Management with Spring Cloud Config Server. The diagram below shows the communication between CCS and FS. We would establish communication between these two components. We would want to be able to dynamically scale up and scale down the number of instances of each of these services. And the number of instances for each service might vary with time. Below picture shows a specific instance where there are 5 instances of the Forex Service. How does the Currency Conversion Service (CCS) know how many instances of Forex Service (FS) are active? How does the Currency Conversion Service (CCS) distribute the load between the active instances? Because we want this to be dynamic, we cannot hardcode the URLs of FS in CCS. That's why we bring in a Naming Server. All instances of the components (CCS and FS) register with the Eureka Naming Server. When FS needs to call the CCS, it will ask Eureka Naming Server for the active instances. 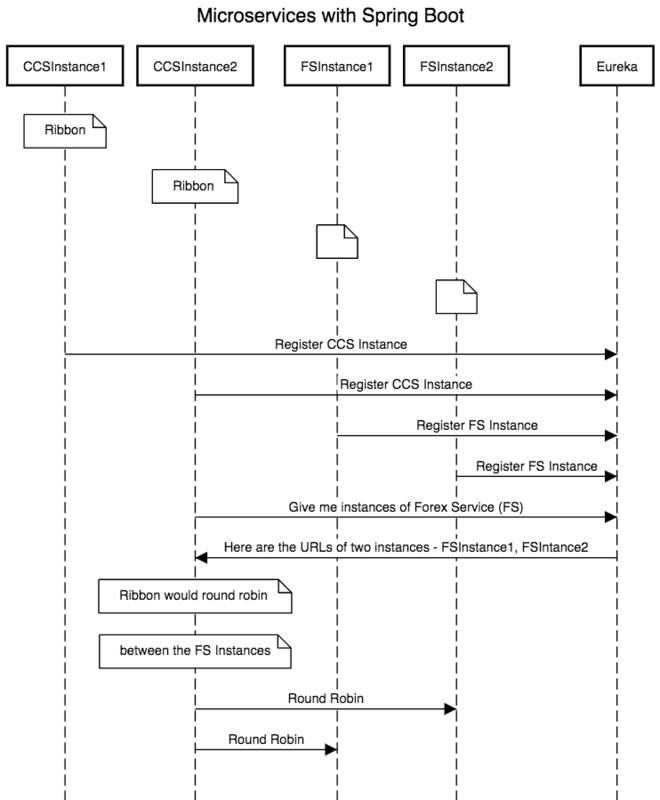 We will use Ribbon to do Client Side Load Balancing between the different instances of FS. Creating a Forex Microservice - We will create a simple rest service based on Spring Boot Starter Web and Spring Boot Started JPA. We will use Hibernate as JPA implementation and connect to H2 database. Use Ribbon for Load Balancing. Implement Eureka Naming Service and connect FS and CCS through Eureka.